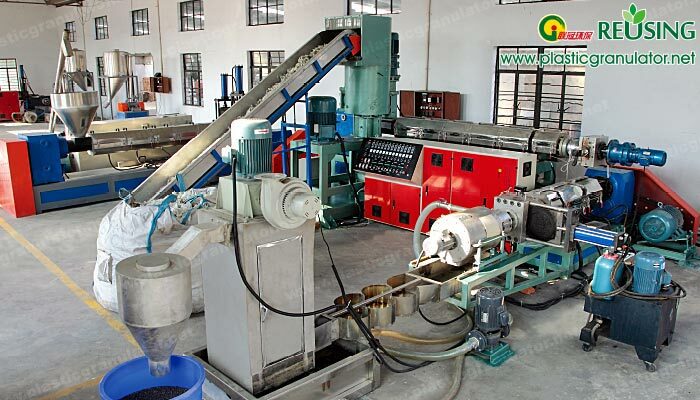 Plastic granulator machine energy-saving can be divided into two parts: one is the power part,and the other one is the heating part. Power part of the plastic granulator machine energy-saving: Most of the inverter, energy-saving way is to save the motor through the remaining energy,such as the actual power of the motor is 50Hz,and you actually need only 30Hz in production is enough to produce those redundant energy. The consumption is wasted,the inverter is to change the motor power output to achieve energy-saving effect. Heating part of the energy-saving: Most of the energy-saving heating is the use of electromagnetic heaters energy-saving, energy-saving rate is about 30% -70% of the old resistance ring. 1. Compared to resistance heating,electromagnetic heater more than a layer of insulation,heat utilization increased. 2. Compared to resistance heating,the electromagnetic heater directly acts on the heating tube,reducing the heat transfer heat loss. 3. Compared to resistance heating,electromagnetic heater heating faster than a quarter or more,reducing the heating time. 4. Compared to resistance heating electromagnetic heater heating speed,production efficiency will increase,so that the motor is in saturation,to reduce the high power and low power consumption caused by the loss. More than four points is to fly, such as electromagnetic heaters,why can energy-saving granulator up to 30% -70% of the reasons.